The social registration system at https://register.social.ncsu.edu/ is a application that allows your social media account to go through an approval process so that it can appear on the official channels page. We have outlines the steps below to streamline the process for you and your organization or department. Start by clicking “Start Request” on the social media registration home page. Use your NC State Unity ID to log in. This page contains a list of fields that are required for registration. Social Network: A dropdown of the social network such as Twitter, FaceBook, etc. College/Department/Group: This is a list of the groups on campus. Search for yours by typing. 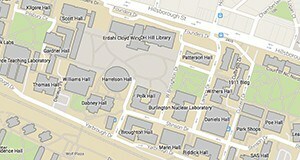 If you do not see your campus, you may add it by checking the box in “Add Other Department” and typing in a field. Please know that if your group is already in the database, you will have to resubmit the request so that there is no duplicate data. Account Name: The official channel name. This should contain “NC State.” Ex: “NC State University Dining,” as opposed to “University Dining”. Social Media Account URL: Please include the full URL. If you are submitting the social media request in advance, then you may leave this field blank. Main Contact: This is the Unity ID of the main contact for the account. This will default the Unity of the individual submitting the request. Administrative Contact #1: All social media accounts must have two individuals that are in charge of oversight or contact for the account. Please use Unity IDs to fill this and the other administrative contact out. Administrative Contact #2: The other social media overseer. Please use Unity ID. Profile & Cover Photo: You may only have to fill out a profile photo. This will be determined from the social network that was selected previously. Please upload only jpg or png files that are under 2MB. For social media icons and profile photos, use iconic photography that expresses the NC State brand and your unit’s mission. Logos are prohibited, as they are often too difficult to visually identify on a mobile device. For instance: https://twitter.com/ncstatetextiles, http://www.facebook.com/NCStateCED. Notes: If there are any additional comments, include them here. After the form is successfully submitted, the main contact and both administrative contacts will receive an email confirmation of it. Our administrators will also be notified. To edit your social media account, please select login on the top right of the social media registration home page. Select “Accounts” then select what you want to edit. You may make changes to your account information here. Just be sure to click save changes. You may also comment/read conversations about your account. Think of this as a chat window to discuss modifications or changes that an administrator may let you know about. All conversations will include an email notifications to the vested parties as well. Feel free to add to the conversation at any point or ask a question there.